William Mulholland never set out to be landlord for nearly 400 square miles of land in the Owens Valley. However, over the past hundred years LADWP’s rampant real estate practices have resulted in half-empty towns, neglected historic structures, and given supervision of their vast range-land to the ranchers. Now these are liabilities for LADWP as long as they have ownership of or maintain their current real estate practices in the Valley. Within the Owens Valley communities it is clear that LADWP has no justification for owning any property not required for their operation – so it is time to divest. Divestment does not imply giving up the Aqueduct, but it is a necessary step with or without a corresponding reduction in water exports. Owens Valley is a magnificent landscape landscape landscape equal to its neighboring National Parks, so why not make it one? Alternatively, the range-land could be returns to the Valley’s Paiute Tribes who were never compensated for losing their land to the farmers and miners in the first place. In 2004, Mayor Kenneth Hahn proposed a conservation easement for Owens Valley. The least LADWP and Los Angeles can do is to make this a reality. 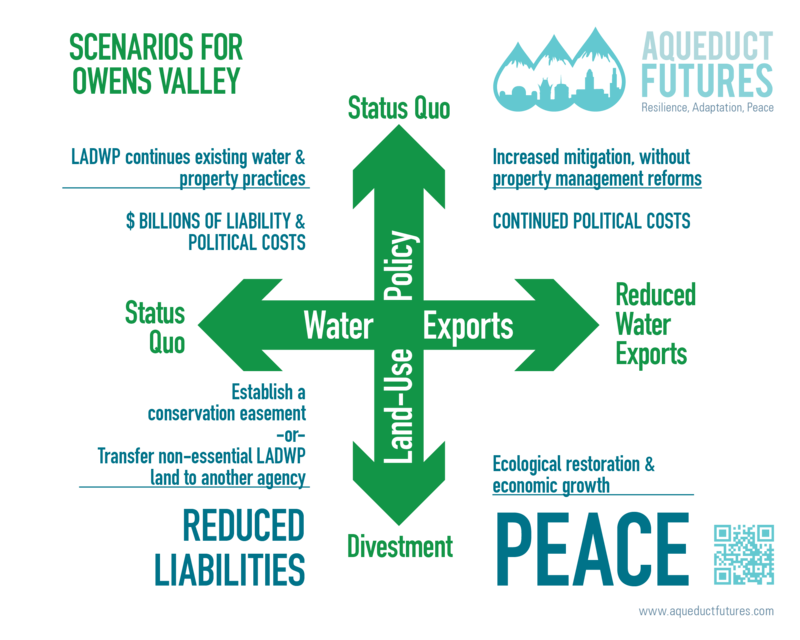 Our focus is developing scenarios and alternatives to the status quo for Owens Valley and next 100 years of the Los Angeles Aqueduct. Water and land are the keys to creating lasting peace. To contribute your own ideas, please complete our survey. Community participation is central to our process, so please share your ideas with us!